The aesthetics of a map usually have much to do with the relationship of form and function. Those that combine elements coherently, harmoniously and with purpose might be said to be displaying graphical eloquence. Then there are the maps whose form is so arresting that it trancends the function…or at least overrides it. 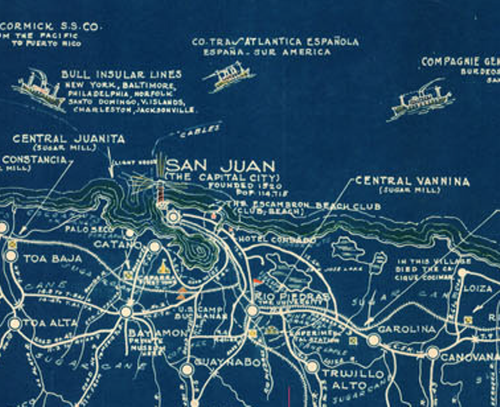 This map by Dominguez from 1935 might fall into this category. 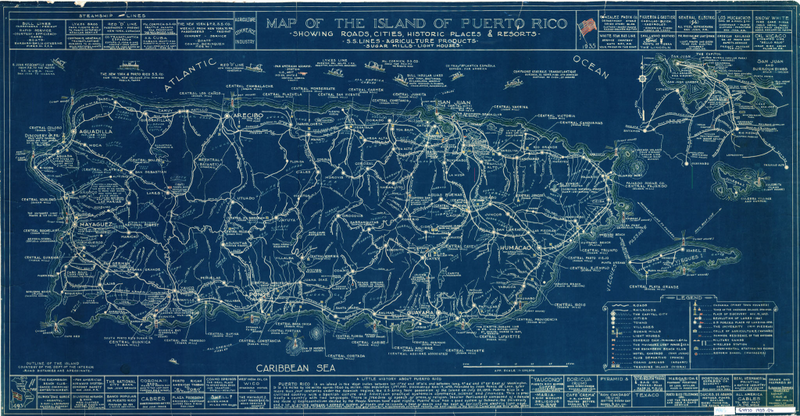 The content is fairly typical of a medium-small scale product showng topographic detail of Peurto Rico. It’s a well crafted map in these terms but it’s the look and feel of the map that draws attention. If you look at the map and think ‘blueprint’ you’d be correct. The map has been printed using cyanotype, a photographic printing process which creates the classic cyan-blue image we normally associate with architectural drawings – blueprints. The process was used extensively in the early 20th century because it was a low cost method of producing copies using chemicals that, when reacted as part of the photo-mechanical process produce an insoluble blue dye. The traditional blueprint is, effectively, a negative image with the brighter areas being those exposed and resulting in the linework and lettering. Additional colours are added by hand but as a way of creating multiple copies of a map it provided an effective solution. In design terms, the authors had to be careful to ensure detail was of a suitable density since the map was effectively two colour and all linework and text sharing the same light tone. Different thicknesses of linework gives the map its visual heirarchy. The look and feel of the map is one that immediately invites inspection and generates interest. A practical approach to managing costs but which creates an entirely unique map. This entry was posted in MapCarte and tagged blueprint, MapCarte, topographic by @kennethfield. Bookmark the permalink.